We have purchased two custom made Aspen Jewelry Designs rings for my wife. She receives many compliments on them and they are never off of her finger. Now, what makes this really amazing, is that we live in Michigan, yet the ONLY jewelry store we use is Aspen Jewelry Designs, 650 miles away. Over the past 17+ years, we’ve developed a great relationship with the talented folks at Aspen Jewelry Designs. They have created the most beautiful pieces for Mary, our daughter, our daughter-in-law and most recently, our granddaughter! We couldn’t imagine trusting any other jeweler to design custom, unique and exquisitely beautiful pieces that capture our dreams and expectations the way Aspen Jewelry Designs does. The family friendly approach to all customers is special and we feel we are visiting friends when we shop with the staff. The talent, skills, convenience and the confidence are all truly first class and we HIGHLY recommend Aspen Jewelry Designs. - Gil and Mary M.
We have used Aspen Jewelers exclusively for the last five years for all our jewelry purchases and repairs. If you are looking for outstanding craftsmanship, knowledge and experience, Aspen Jewelers has it all. 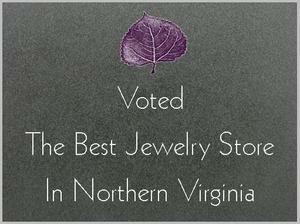 Their jeweler designs are unique and of the highest quality and the designers go out of their way to make you feel special. We highly recommend Aspen Jewelers for all your jewelry needs. - Ray and Robin F.
If you walk past fine jewelry stores and think that you could never afford anything from there, then you must come into Aspen Jewelry Designs. You will find gorgeous pieces in an extensive range of prices. And, if you have family pieces of jewelry that you don’t wear you can bring them to Aspen and have them custom design a piece just for you! It will give you joy each time you put it on and will bring you compliments from friends and strangers alike. Co-owners Kurt Rose and Rick Little always make you feel welcome. They have the patience and personal touch to let try on jewelry until you find your ideal piece. Despite my love for fine jewelry, especially designed for me by the men at Aspen Jewelry Designs, I have to admit that I used my jewelry as a teaching aid. I am a retired mathematics teacher, having taught around 35 years from Texas to Virginia. One day a young man in one of my classes asked me why I had so much jewelry. Flippantly I responded that every time a student or a class upset me with their behavior, I would go and buy a piece of jewelry to make me feel better. From time to time, feeling guilty, I guess, he would come by and ask me if I had bought any jewelry the day before. Usually, I would respond that he had not been that bad, so no, I had not bought any jewelry that day. I think it made him reflect upon the fact that his behavior could make me feel bad. This was all tongue and cheek and we had a lot of fun with it. Truthfully, I love my jewelry from Aspen Jewelry Design and I would not consider buying elsewhere. Rick and Kurt feel like my brothers and I trust them to tell me if a piece of jewelry looks or does not look good on me or if it is too delicate for my life style. I feel so elegant when I wear my jewelry even if it is a fancy piece worn with jeans.